Draw your way to meditation! For some time, I have been seeing a wonderful pattern drawn by CZTs (Certified Zentangle Teachers) appearing in the Zentangle Mosaic app on my iPad. 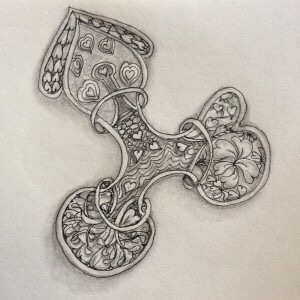 It is intricate, beautiful, and full of tangling possibilities. The tangle is called Way Bop, an interesting name selected during a CZT-only event in 2016, when it was first introduced. 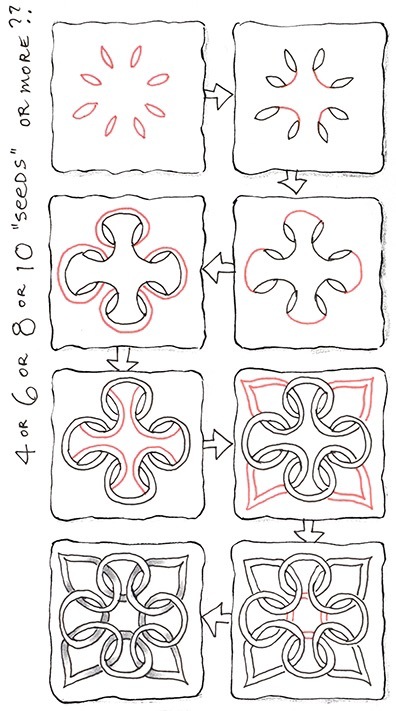 Often, when Zentangle puts out a brand new pattern, the step-out is first provided only to CZTs to teach in their own workshops. After a while, the step-out is made available to everyone else. Some patterns are relatively easy to deconstruct. 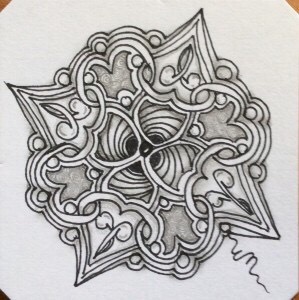 This was not one of them for me, and I was delighted when the step-out was made public this past week in the Zentangle blog newsletter (click to view it). Along with it came a variation with a heart motif for Valentine’s Day. If you are an avid tangler and subscribe to the Zentangle app for iOS or Android, you also have access to an exclusive video showing founder Maria Thomas drawing and embellishing this pattern while founder Rick Roberts narrates. Because this is still a very new pattern for me, my interpretations are still elementary and awkward. Despite this, my attempts are not too bad–not as elegant as they may later become, and lacking any great artistic qualities, but pleasant and intricate enough for early tries. The one on the right was drawn as a Valentine, based on the heart variation step-out of Way Bop. On the left is a first shot at something more intricate than the simplest result. Looks difficult, doesn’t it? Well, here are copies of the Step-outs from the newsletter to show you how easy this pattern becomes once the steps are logically presented. Just follow the arrows! The spaces created by the Way Bop pattern can be filled with other patterns, surrounded by tangles and embellishments, colored in–so many possibilities! 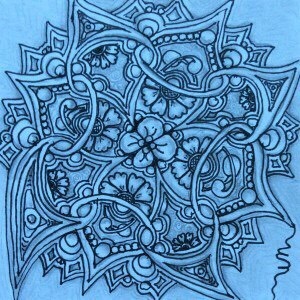 Just drawing this pattern is soothing and meditative. Adding elements to enhance the tangle is challenging, fun, and meditative in its own right. If you are on the island of St. Martin in the Caribbean, as resident or visitor, feel free to contact me. In two months, I will be attending a certification seminar in Rhode Island, earning my certification. I will return home to my island as a CZT, ready to spread Zentangle to everyone who wants a meditative methodology that results in a small work of art, especially to those who are convinced they can’t draw. I can’t draw, but I can tangle! A Wonderful Class at MHF Last Evening!